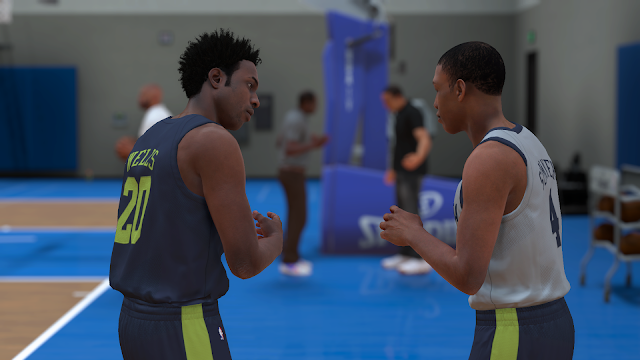 The NBA season is upon us, and 2K Games has finally released their newest hoops game. Does it hold up to the hype? Microtransactions is cancer and this game is riddled with it. Can’t see what who your opponent is choosing during online play (Play Now). Can’t skip meaningless cut-scenes during in MyCareer. Did you make the MyCareer mode so tough this year? Serious don’t expect to score more than 8 points a game until you rating is over 70. Why does the MyCareer look like it came out last gen systems. I purchased the Xbox One version because I wanted to enjoy a basketball game looking its best (and play against my friends online). Now I’m regretting not getting the Nintendo Switch version… The Xbox One, and PS4 versions don’t look that much better. NBA 2K series has been the number 1 Selling basketball game for years. The game is typically praised for being the best basketball sim available as well as having the best presentation. Honestly speaking, I am not impressed here. It is actually kinda sad being that 2K is known for having the best looking games. Don’t get me wrong if you mostly play Online or in the Play Now mode this game looks great. Presentation also is top-notch like you would expect form 2k. The game just turns ugly when you play in the MyCareer Mode. Seriously everything look like it came right out of 2013 on last gen consoles. I wish they took more time to develop the My Career modes visuals, that's where you will be spending much of your time. Your usual NBA2K stuff here, though the kicked up the difficulty or should I say frustration meter way up in MyCareer mode. Putting everything behind a paywall kinda hamper the gameplay a bit to. While VC points aren’t difficult to obtain but I hate having to spend them on Hair cuts i have already purchased… Playing online is a bit annoying as well. I’m not sure What 2K was thinking but I would like to see what team my opponent is picking so I don’t choose the same one. There is nothing worse than playing against the same team i chose 4 times in a row… Load times are almost unbearable in MyCareer mode. You load to get into the hub over-world, you load to get into the practice gym, and you load to get out of it. You load to get into game, You load for the locker room, and you load after the game. Then you load again to go back to the hub over-world. It's all pretty awful, especially knowing that you have to do this for every f’n game. This much loading in a 2017 game that has a 45GB+ install footprint is ridiculous. Oh and you can’t skip cut-scenes… Even the ones that don’t require your decisions. 2K normally gets this right yearly so there are no surprises here. You get a decent mix of today’s and yesteryears Hip Hop with a few other hype tracks. Voice acting is good and the announcers are pretty much spot on. I’m sorry by this game especially in its current condition is no way worth the price of admission. “Save your money folks (in Donald Trump Voice)” the game will drop in price in the next few months. I can almost guarantee you can buy this for $40 or $50 around black Friday. I feel sorry for the people who brought the legend's edition for $150. First off I’m gonna say it is bizarre how Gaming Journalist and Consumer are on the opposite sides of the richter scale when it comes to this game. On MetaCritic the game is getting an 8.5 or 85 from professionals but only a 1.6 or 16 from consumers. Also, on Amazon the Game currently has a 2.1 or a 42. This tell us a few things. One gaming news outlets need to start being more transparent. If they are being strong armed to produce positive reviews they need to stop doing them and misleading consumer for a dollar. Two 2K needs to revamp their NBA 2K team because i can see consumers looking elsewhere next year if this keeps up. Realtalk, i am so disappointed. I was looking forward to jumping back into the sports game genre with the latest and greatest basketball game being that basketball is my favorite sport. And then i ended up with this… An unpolished basketball sim with issues i find hard to look past. I feel this game is best used for playing locally with friends until some bugs and annoyances are addressed. Don’t get me wrong, the game isn’t bad it just isn’t what i was hoping for. 2K Sports let their greed take control this time and it shows. You shouldn’t have to pay extra to enjoy a game and, that's what 2K wants you to do here. It also doesn't do much for their character being it appears they corrupted the media into giving out good scores. Just wait for a price drop. This game as is, isn’t worth the price of admission.